Do You Have 'Rushing Woman's Syndrome'? - Women and Money Inc.
« What Money Mistakes Are You Making? Do you often look at the clock at the end of a long day and wonder where the time went? Do you compare your life to other people’s, especially on social media sites? Do you find that you are stressed out, irritated, and generally unhappy most days? According to some individuals, you might be a victim of “Rushing Woman’s Syndrome” (read the news story on this here). Rushing Woman’s Syndrome is characterized by several things – constant ‘busy-ness,’ feeling overwhelmed, tired, irritable, depressed, or anxious (according to Dr Libby who coined the term). A hormonal imbalance can also contribute to or complicate this issue. To eliminate the possibility of confusing it with mood disorders or mental illnesses, professionals have been wary to acknowledge the validity of “Rushing Woman’s Syndrome;” however, there is no doubt that the modern woman is under considerable pressure. Overall, Rushing Woman’s Syndrome seems to be more of an overall summary of the combined day-to-day stresses that we experience. So if it’s not an actual medical disorder, why it is resonating with so many women (and men)? The growth of social media sites such as Facebook, Pinterest, and Instagram means that we can constantly compare our lives to others, which as we know, is not a good thing. Instead of celebrating our friend’s and family’s successes, we often feel jealous of their good fortune or look for their failings. Social media has exacerbated this issue by giving us accessibility to each other’s lives 24/7. However, the question does need to be asked – what part of our lives are we sharing? Of course, we aren’t sharing the boring, day-to-day mundane details – we are sharing the fun times, the exciting vacations, the joyful outings or holidays with our children. We are carefully curating an image that we want others to see and that we want to believe. It is, however, not a complete image of who we truly are, and the lives that we actually lead. Not only does comparing our lives on a fundamental level harm our self-esteem, it also leads us to think of our output as not enough and drives us to work harder. Now, you may be thinking “Is working harder really such a bad thing?” and the short answer is – no! However, the reasons behind why you are working harder should be examined. If you are working harder towards achieving your own goals, then you’re on the right track. If you find that you are working harder towards an inauthentic life vision, therein lies the real issue. One of the reasons that people get caught up in this cyclical trap is because they don’t take the time to really examine what they want – they are busy measuring up to an image of perfection that someone else has created. Another reason that women may become entangled in Rushing Woman’s Syndrome is because they are afraid to ask for help or they don’t know how to. As a society, we have created an image of the ‘nagging wife’ – I’m sure you’ve heard the jokes and comments about her. However much we want to downplay our comments as jests, the truth is that we hold a negative view of a nagging, complaining wife. We see her as needy, unsatisfied, dependent, and overburdened. The truth is that she might be some of those things, especially unsatisfied and overburdened. Her inability to reach out to her spouse in an honest way is diminishing the quality of her life and she feels trapped in a cycle of ‘overdoing it’ every day. She’s stretched to the maximum yet she still can’t seem to do and to be enough. She is afraid to become the nagging wife, but she’s also terrified that she can’t keep going with this much intensity for much longer. Ask for help. The main purpose of having a life partner is for them to support your goals, help you when you need it, and love you unconditionally (and vice versa!). Don’t ask for help in a generic or accusatory way (“You never help me!”) – ask for assistance with specific projects or tasks. Be sure to adjust your expectations if someone else is helping you – they will not clean the same way as you and they will not approach a task in the same way. Reciprocate help when you can and be thankful when you receive it. Go offline. Whether we like to admit it or not, social media sites have given us a false sense of ‘real life.’ As we know, real life is a combination of responsibilities and excitement, and social media often doesn’t reflect this. Consider setting a limit on how often you check your social media. Going offline for a while – whether it’s a day or a month – allows you to escape the negative emotions that go along with comparisons. Deliberately set goals. By reflecting on what you want instead of focusing on what others want, you can escape the trap of chasing things that aren’t authentic to you. Once you establish your priorities, you can begin saying “no” to things that you never wanted in the first place. Reclaiming your time for yourself and your goals is a huge step in freeing yourself from Rushing Woman’s Syndrome. Be where you are. Too often we are in multiple places at once. Nowadays multitasking is touted as necessity in our complex world, and while I’m sure it’s important, I don’t believe it’s always essential. To be engaged in one task at a time cultivates mindfulness and allows us to achieve greatness in that one task. By spreading ourselves over multiple areas at once, we are drawing away our focus and compromising our potential. Start being engaged by tuning out other parts of your mind that are wandering away from the task at hand – if you are baking with your children, focus on that one activity together, not on how much work you have to accomplish tomorrow morning. If you are going out for a run, use that time to clear your mind from your day’s trials and look around at your surroundings. At work, switch off from social media and water cooler gossip. Ditch energy vampires. A big part of Rushing Woman’s Syndrome is over-committing – to people, activities, and jobs. Taking on projects, achieving goals, and maintaining relationships is a huge part of life; however, only you can tell if what you’re doing is draining you or fulfilling you. Taking time to think about what or who your ‘energy vampires’ are and how you can become free of them is a key component in reclaiming your life. Remember – sometimes it seems like a great idea to have a large group of friends and a lot of projects on the go, but truthfully you end up being “a jack of all trades, and a master of none.” Make decisions with your priorities at the forefront. The truth is people claim that their priorities are their family, friends, health, career, passions, etc., but their actions often reflect something different. Reclaim your life and your time by taking deliberate actions to change your life and your attitude towards your obligations. 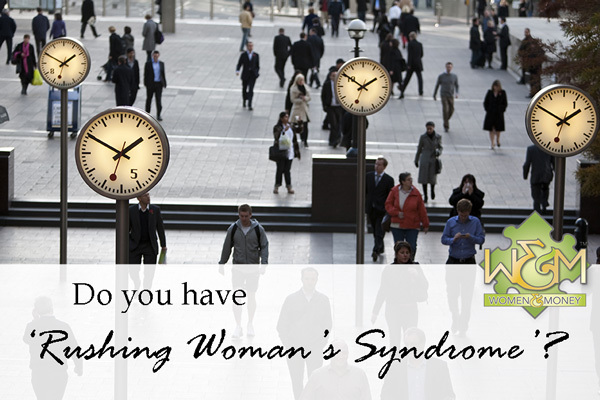 Maybe one day soon we can move from Rushing Woman’s Syndrome to Reasonably Paced Woman’s Syndrome. What do you think? Is Rushing Woman’s Syndrome real or is it merely the reality of being a modern woman?